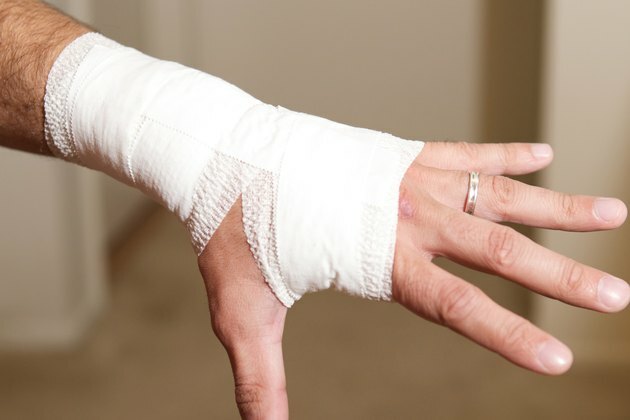 Wrapping your wrist can help you prevent injury or recover from an injury by protecting and supporting the joint and muscles. The two main types of athletic tape -- zinc oxide and elastic adhesive bandage -- each have their advantages. 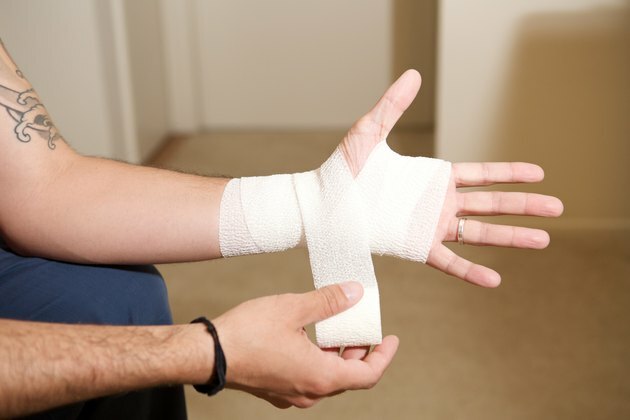 The stiffer zinc oxide tape restricts the movement of your wrist and helps prevent blisters. 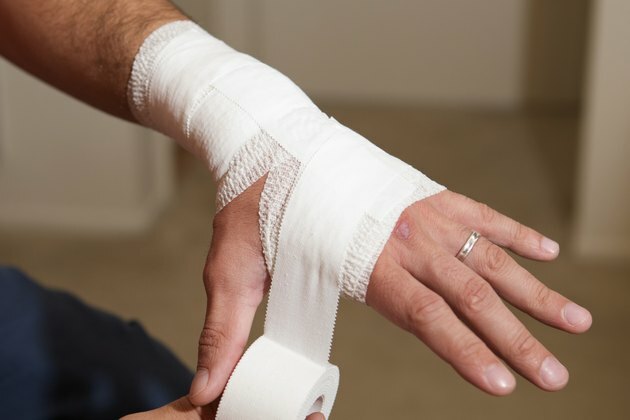 Because it is flexible, elastic adhesive bandage is ideal for workouts where you actually need to move your wrist. Wash your forearm, wrist and hand with soap and water before taping. The skin should be clean and dry before applying tape. Wrap the pre-wrap below the wrist joint and over the wrist, reports Pre-wrap.com. Continue to wrap the back of the hand and cross the pre-wrap over the palm of the hand and finally between the thumb and pointer finger. A soft foam that does not stick to the skin, pre-wrap protects the skin from becoming irritated from the tape. 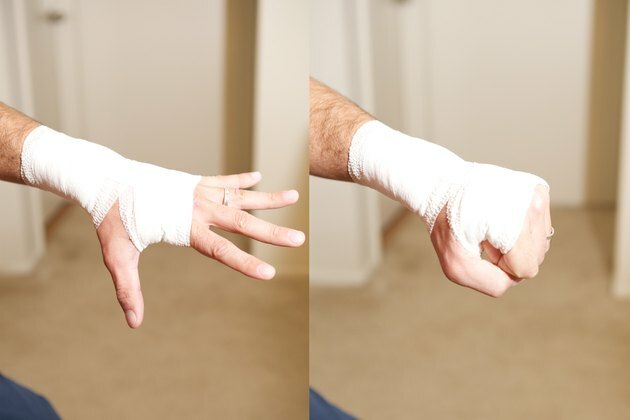 When applying the pre-wrap, keep the hand flat and the fingers spread apart. Stabilize the wrist joint by placing one of the two types of athletic tape just below the joint of the wrist. Starting from the outside and moving toward the inside of the arm, pull the tape in a circle around the wrist. Keep the tape flat and smooth as you wrap the tape around the wrist and hand. Then, cut the tape. Wrap the athletic tape on top of the first strip and over the back of the hand. Wrap between the thumb and finger and across the palm of the hand. According to Pre-Wrap.com, continue this pattern three to four times. Move your fingers around to make sure that they can move freely and without discomfort. The athletic tape should not be so tight that it cuts off circulation or limits the movement of your fingers. If your fingers turn blue or you start having a tingling sensation in your hand and fingers, the wrap is too tight. Cut the wrap off and start again. Cut off the wrap with scissors when your workout or game is over, unless your doctor or athletic trainer recommends that you keep it on. Wrapping is easier if someone else can wrap your wrist for you. If your fingers become tingly or turn blue or purple, the wrap is too tight and must be taken off. Always consult your athletic trainer, coach or doctor for any injury.